I mean really, do I even need to talk about these? 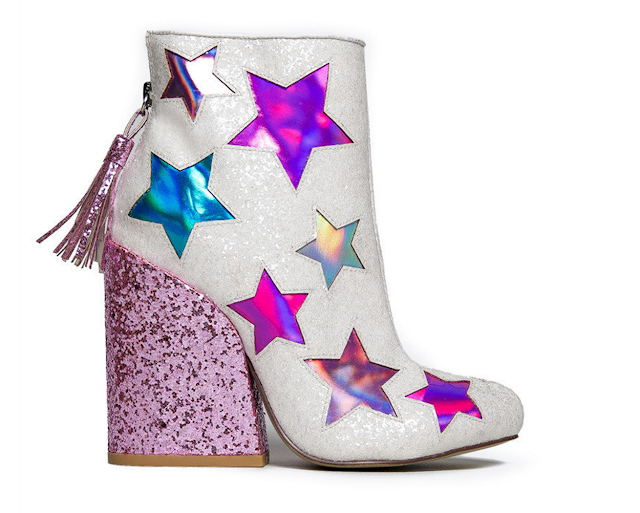 Truly Outrageous Boots. I happened to be quite the Jem fan back in the day. Yeah, I'm kinda old. It's a thing. The Holograms have two rival bands: "The Misfits" and "The Stingers". The Misfits are composed of petulant rich girl Pizzazz (real name Phyllis Gabor) and her cohorts: no-nonsense guitarist Roxy (Roxanne Pelligrini) and kind-hearted, sensitive keytar player Stormer (Mary Phillips). They are joined later by the manipulative British saxophonist Jetta (Sheila Burns). Back to the boots. The linked image above is for YRU's site, buuuuuut I found them cheaper (although not in my size) on The Moon Cult. Who wants to start a band? I call shotgun on these boots and the keytar.